February Family Day Escape. | Coach Billy. My wife and I finally had our first long weekend together! We went eastbound from Toronto to explore Kingston, Montreal, and Quebec via a tour company. Aeda had been to some places there before but winter changes everything! 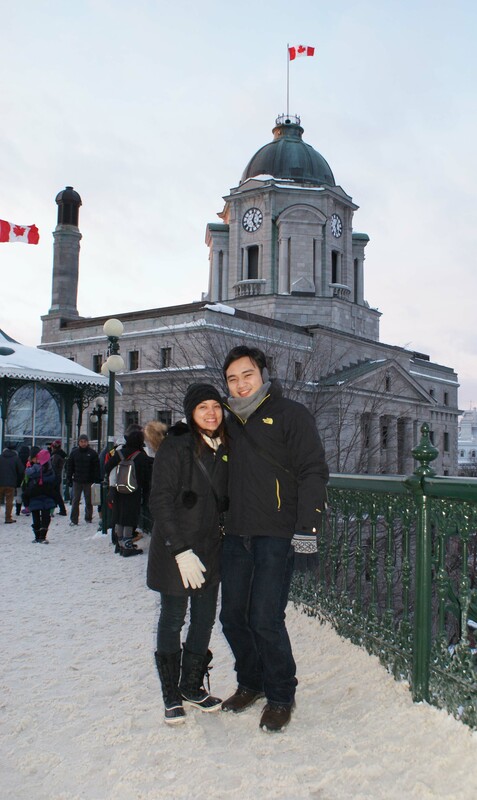 Our first stop was at Kingston where we went to the City Hall that overlooks the frozen lake Ontario. We were blessed to have the sun shining bright on us in the middle of the day. 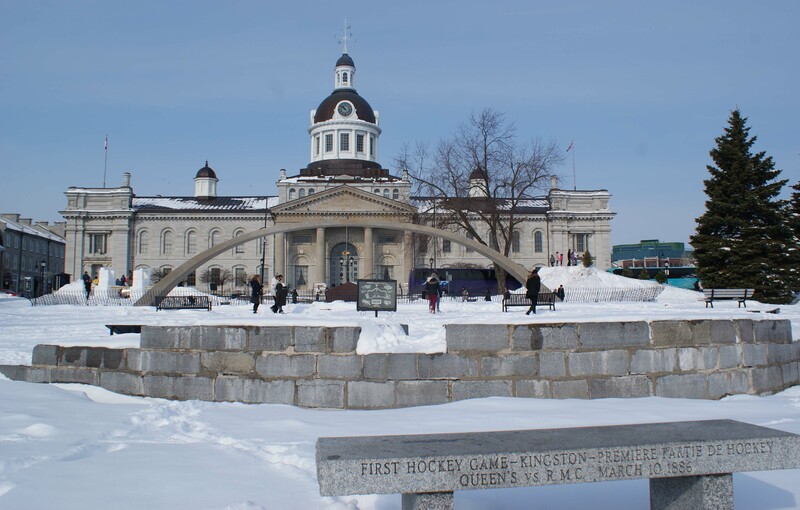 Kingston is one of the places which claims that the first organized hockey game was played there (1886). However, further research says that hockey was played first in Montreal (1875), and even further east and earlier in Nova Scotia (1800). After lunch at Tim Horton’s in Kingston, we headed straight to Parliament Hill in Ottawa. The Hill is part of a “Crown Land,” an area belonging to the monarchs – the Queen in Right of Canada, who is currently Her Majesty, Queen Elizabeth II. The land cannot be sold but only passed on to the next King or Queen. The parliament buildings are three edifices arranged around three sides of Parliament Hill’s central lawn. The Centre Block contains the Commons chambers. It is fronted by the Peace Tower belfry on the south facade and the Library of Parliament is located at the building’s rear. The East and West Blocks each contain ministers’ and senators’ offices, as well as meeting rooms and other administrative spaces. The Peace Tower, officially the Tower of Victory and Peace (French: tour de la Victoire et de la Paix) is the climax of the view over the Parliament Building. It is not only built as an architectural feature and landmark, but also as a memorial for Canada’s major conflicts during World War I (yes, Canada was involved in a World War). 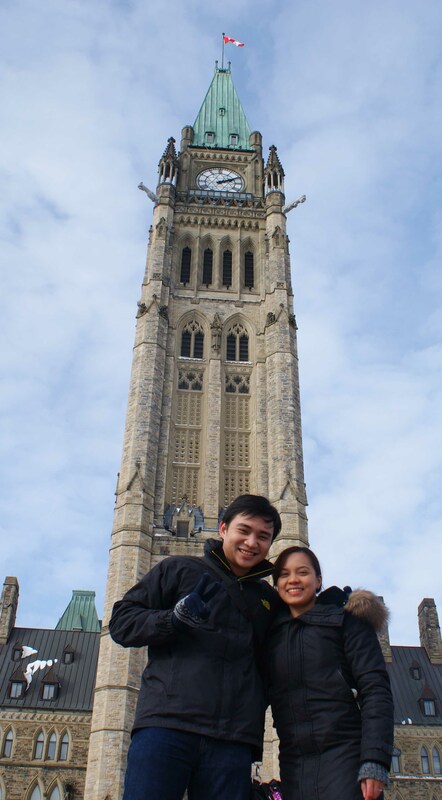 The Peace Tower was named in commemoration of Canada’s commitment to peace. On the third floor is the Memorial Chamber, a richly carved room of gentle light built to honour Canadians who died in the armed conflicts in which Canada has fought since Confederation. The 92.2-metre tower also contains an observation area and the Carillon, a series of 53 bells weighing from 4.5 kg to 10,090 kg. The Dominion Carillonneur entertains visitors to Parliament Hill with regular recitals. There were many other statues and memorials around the area. 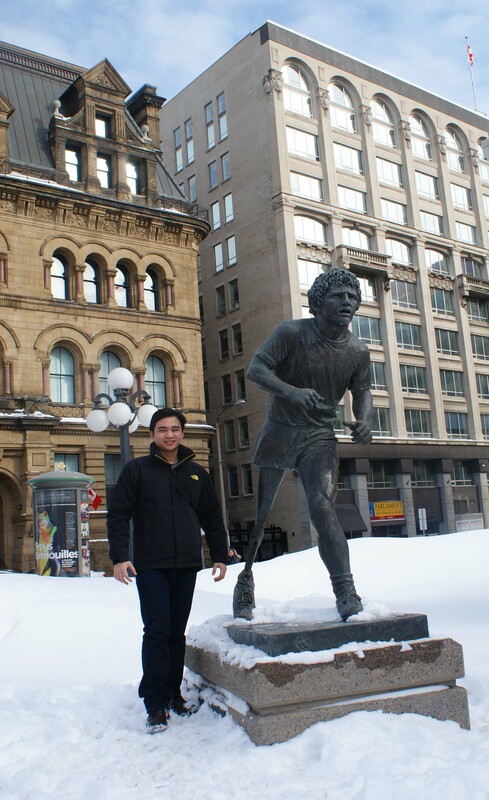 The one-legged marathoner Terry Fox has a monument right across Parliament Hill to commemorate his death on June 28, 1981. 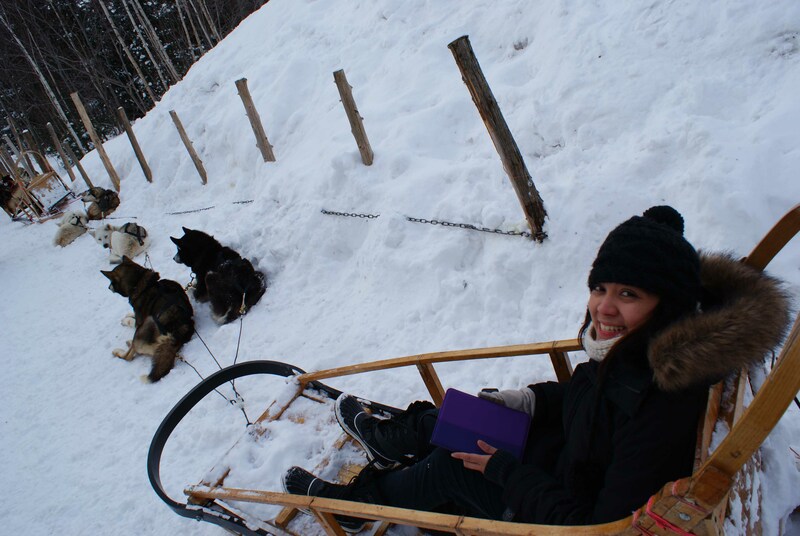 After the Canada-immersion day was done, we were bound for an adventure the next day! We woke up early (a mysterious person, a.k.a. the tour guide, set an early wake up call for us through the hotel reception) and headed to our next destinations. We went to Érablière du Cap – St-Nicolas – Québec for the Sugar Shack, a restaurant which offers meals made with, on, and for maple syrup. 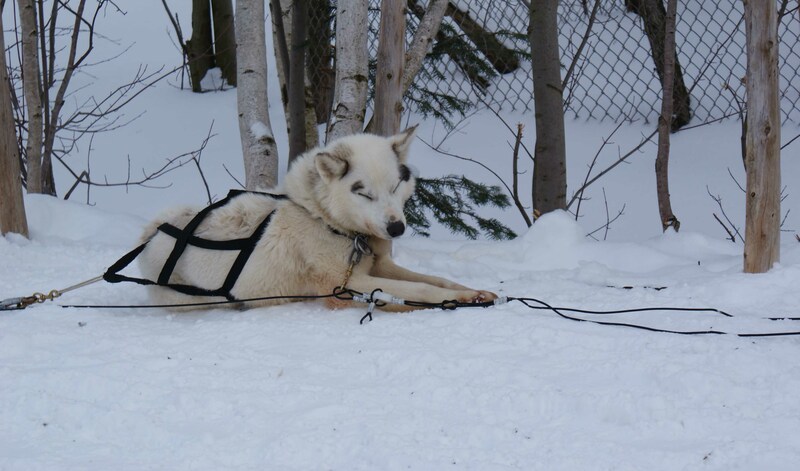 Their maple farm also has a dog sledding track where my wife and I had quite an experience with fierce sled dogs and lots of snow. 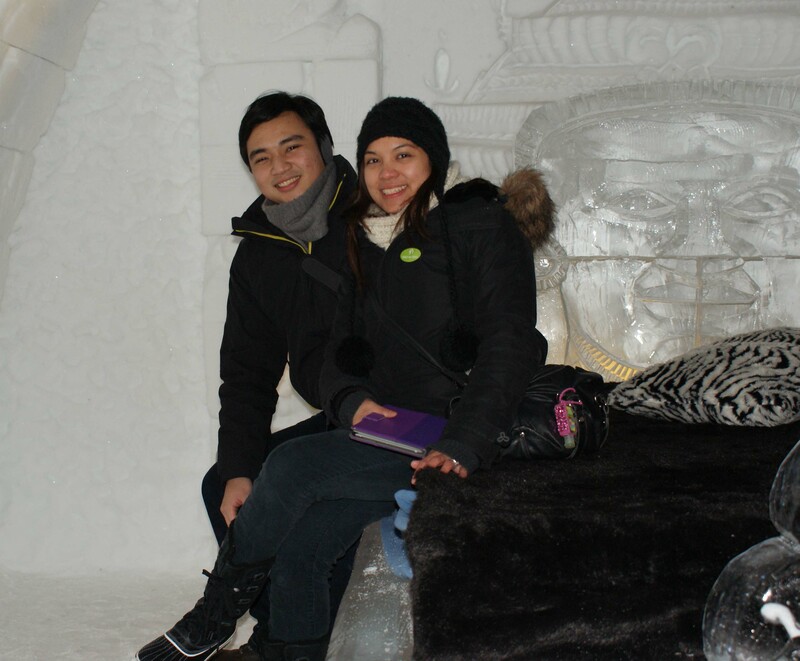 We headed to Hotel de Glace – Quebec City’s Ice hotel for more snow and ice. They claim that people can book an accommodation and even sleep in that hotel, but we think otherwise. Building a hotel made of snow and ice is amazing, but the details in the sculptures inside looks even more exquisite! 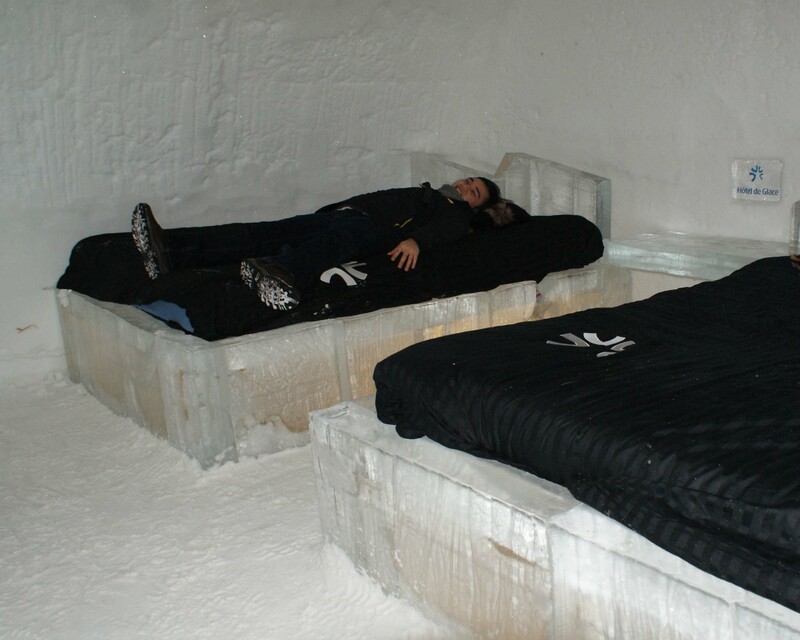 Wanna sleep on an ice bed after a long chilly day? We concluded our tour walking under the sunset around Old Quebec, a UNESCO world heritage treasure. The area is filled with amazing landscape and sights of wonderful architecture. Winter tour is done — Spring, Summer, and Fall tours next!